The big question on the minds of most investors is what will happen to the markets and precious metals in 2019. Well, the answer depends mainly on two factors, the oil price and overall weakness in the economy. 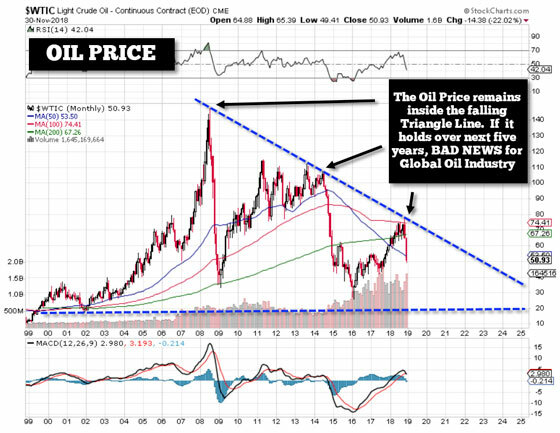 If the oil price continues to decline, it will indicate a deflationary outcome for the economy and markets. While this sounds counter to the notion that falling oil prices will drive higher consumer demand, we also must remember that it will negatively impact the U.S. shale oil industry. A lower sustained oil price, as I wrote about in my previous article, IT BEGINS… Rapidly Falling Oil Prices First Guts Tar Sands, Then Shale Oil will begin to destroy the oil industry, especially the unconventional oil industry. I don’t believe Americans or the investors realize the tremendous amount of economic activity it takes to produce shale oil. Now, the last U.S. economic bubble in 2007-2008 was based on a highly leveraged housing market. However, the present economic bubble is being propped up by the U.S. Shale Oil Ponzi Scheme. Some energy analysts don’t believe the U.S. shale oil industry has that much of an impact on the market, but I disagree. Since the 2008 market crash, the U.S. shale oil industry has brought on nearly 7 million barrels per day (mbd) of tight oil. U.S. oil production has surged from 5 mbd in 2008 to 11.7 mbd currently. It is important to understand that Day traders, Swing Traders, Investors, Hedge Funds and Institutions set the stock market prices based on momentum and technical analysis for the most part. On the other hand, fundamental analysis is a more prominent factor in determining the market value of energy, metals and commodities prices. Let me explain. A stock like Amazon, which reached $2,000 this summer, is not based on fundamental analysis. Rather… Day traders, Swing Traders, Investors, Hedge Funds and Institutions have bid up Amazon’s stock price to a stunningly high bubble level. Thus, momentum and technical analysis have provided the principal traders and investors with the desire to follow Amazon’s stock price to the top. But, because fundamental analysis of realistic price ratios (such as PE Ratios) are overlooked, the crazy market continues to push stock prices like Amazon to insane levels. Furthermore, I explain what is going on in the gold and silver price charts. Interestingly, gold and silver are much closer to their BASE PRICE LEVELS than are the broader markets. Which is why I don’t believe we are going to see a crash in the precious metals prices along with the broader markets. However, if the oil price does continue to fall lower, which seems likely, then it could pull down the gold and silver prices a bit more in the short-term. 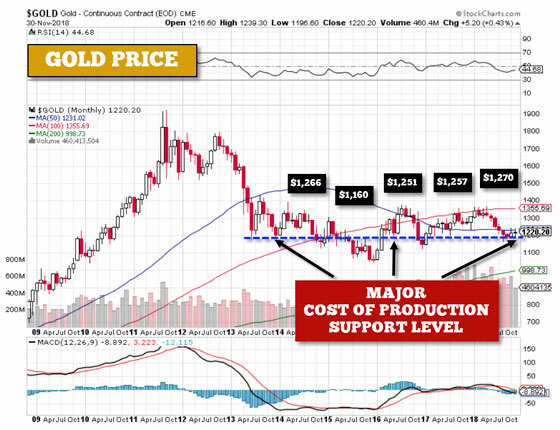 While the gold and silver prices are close to their base support levels, due to the cost of production, the broader market valuations are in bubble territory and will likely start to correct violently in 2019. Thus, as the markets continue to crack (crash), FEAR will motivate investors to rotate out of Stocks and Estate and into the precious metals. With very few assets to protect wealth, the amount of momentum from Day traders, Swing Traders, Investors, Hedge Funds and Institutions into gold and silver (and the miners) will push their values to new record levels.